Thread in 'Hardware' started by TGGC, 25 Nov 2018. What is the preferred method of watching your NES on a CRT TV set and capturing it at the same time? Is it ok to just y-split the signals? 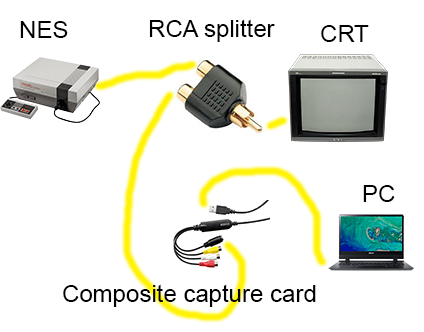 Only found capture devices for RCA which did with inputs and no outputs. Yes, you are right! After trying I decided the result is good enough for me! I tried to find information about it online ahead of time but only read this solution will decrease the signal quality. For me a can barely see something changed after plugging in the second cable.